Welcome to day 9 of the Simply Charmed Blog Hop hosted by Melissa of Happy Quilting. 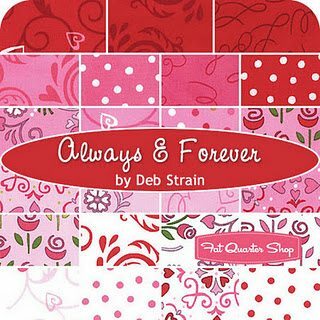 Each blogger was given the challenge of making a Valentines project using one Charm Pack from Deb Strain – Always and Forever. So, I decided on a simple wall hanging / table topper. Step 1 – Making the border blocks. 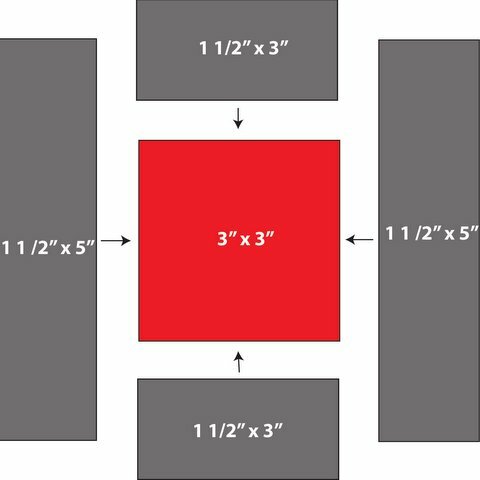 Sew a solid 1 1/2″ x 2″ rectangle to each end of a 2″ x 3″ charm piece. Make 12. Sew a 2″ x 5″ charm piece to each end. Make 12 – 5″ x 5″ unfinished blocks. 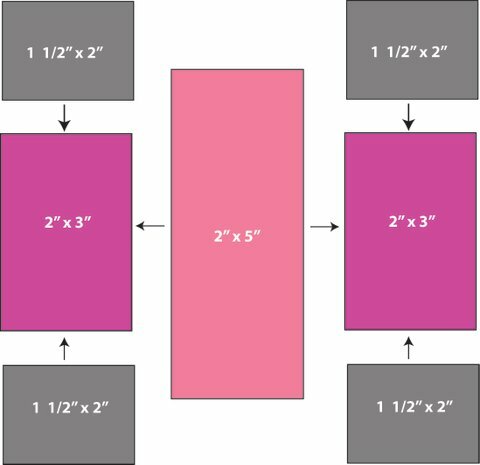 Sew a solid 1 1/2″ x 2″ rectangle to each end of a 2″ x 3″ charm piece. Make 24. Sew to each end of a 2″ x 5″ charm piece. 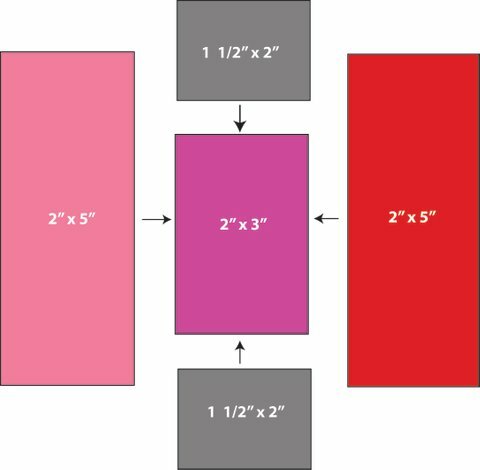 Sew a 1 1/2″ x 3″ solid rectangle to the top and bottom of a 3″ x 3″ charm piece. Sew a 1 1/2″ x 5″ solid strip to both sides of the 3″ x 3″ charm piece. For the top and bottom border, alternate Block 1 and 2 until there are 6. Repeat for side borders adding block 3 to each end. Hint: At this stage I chose to quilt the background as I was using hand turned appliqué technique to add the hearts. It is a personal choice whether you quilt at the stage or later. Download Heart Template here. Remember when printing, do not ‘Fit to Page’ or scale file. I used a product called Stitch n Wash – a light fusible product sold by Floriani. There are many techniques available for appliqué. You may choose to do raw edge or hand turned for your project. I like hand turned appliqué as it makes the hearts puffy and gives them dimension. Trace the heart shape onto back of fusible product. Cut on trace line. Press as per manufacturers instructions to back of 3″ x 3″ charm piece. Notice the placement on the square. This will give me a nice 1/4″ seam allowance all around. Cut around heart shape leaving 1/4″ for seam allowance for turning. Using a sharp pair of clipping scissors, clip into seam allowance on curved edges to a few threads away from outline. Using your glue stick, turn over the edges and glue to fusible template. 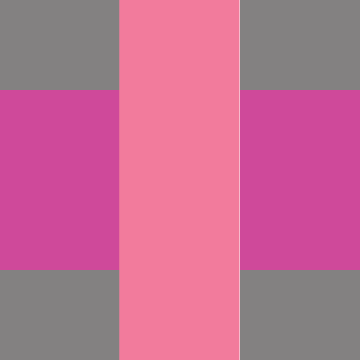 Hint: I separated the charms into colour groups – reds, deep pinks and light pinks and whites. I used red for the corner block 3 and centre hearts. Deep pinks for second row of hearts and the remainder for the outer circle of hearts. 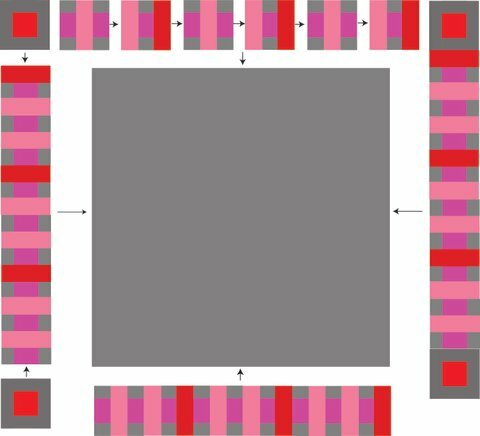 Find the centre of the background by folding it in 4 and finger pressing. 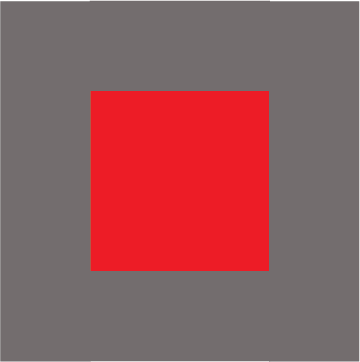 Place the 4 red hearts on fold lines with equal spacing between them. Using a 10″ dinner plate make a paper template. Fold the template in four to find the centre. Place the 8 dark pink hearts evenly around the circle with the tops of the hearts just protruding from under the template. Make another template 14 3/4″. Fold in 4 and find centre. Place the remaining 14 hearts evenly around the circumference of the template. When you are satisfied with the layout, place a dab of appliqué glue to fix the hearts in place and pin. Using matching thread and appliqué stitch, sew the hearts in place. Quilt, bind and label your project and share it with someone you love. I hope you enjoyed this Valentines project. Today as part of the blog hop, Judi from the Green Fairy is giving away one lucky blogger a $25 gift voucher. 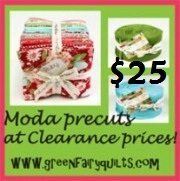 Not only does Judi have a wide selection of discount Moda pre-cuts, she is one amazing and talented quilter. 1. Please leave a comment sharing any story about Valentines Day. For example, I had a job which allowed me to travel overseas, so I would write anonymous Valentines cards and post them from all sorts of odd places around the world. My friends would receive them and spend weeks working out who they were from. 2. For an extra chance, please become a follower and tell me that you are now blog stalking me. 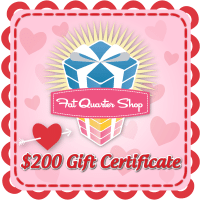 To enter the grand prize draw, go here for a chance to win a $200 gift voucher from the lovely Kimberly and team at Fatquartershop. The giveaway on this blog is open until 20th February 2012. Don’t forget to visit all the other blogs for your chance to see some amazing projects and enter the giveaways. February 14 – Happy Valentines Day and the Grand Prize Winner Announcement. Thank you Melissa for organising the hop and Judi, Julie, Leah and Kimberly for being such generous sponsors. Oh I love your project. So sweet! Thanks so much for sharing! We don,t really celebrate Valentine's day in our family. We try do show our love through little surprises during the year. But since I am connected to the bloggerworld I always saw those cute projects and read stories, so this year my loved ones will get a little giftie from me. Even for my DH I have a miniquilt in work to show him my love. Cute! Gorgeous quilt Jane! Love the plate tip for getting a tidy circle. I don't have any Valentine's Day stories to share – how sad! I'll have to remedy that! I'm an official follower now! Thanks for the giveaway! Alas, all out of valentines, and related stories :o( Still, there's 3 more days to go, right?! I put pink construction paper hearts all over the house for my hubby to find one year…bathroom mirror, bedroom, fridge etc. What a stunning table topper quilt! I love the deep grey you chose to offset the pinks, as well as shocking pink threads for the circle quilting! My cautionary Valentie's story: one year, when I was about ten, I brought in Valentine's cards for all but one of the kids in my class, the girl who bullied me. The teacher asked if I had counted wrong and I answered that I hadn't. I felt so ashamed (and still do) when I saw how alone and miserable she looked. So not worth it, she was just another kid like me, needing some smiles and heart jokes just as much as I did. yep, I'm a follower of your blog. A Valentine's story …. every valentine's day my hubby bring me a special flower with a special story for us!!! One year on Valentine's Day we were traveling home and got caught in an ice storm and were stranded on the side of the road for hours along with many other travelers and our supper that day was a loaf of bread we had to break off and yet it was a great memory . Lovely project! Your project is gorgeous! Typically people use white as a background for valentine's things but the grey is a fresh twist and looks outstanding. And the pink quilting thread on the grey really finished it beautifully. No big valentine's stories, but I do remember my Dad always wrote these cute and silly poems on the envelopes of cards he gave to my mom and to me and my sisters on Valentine's Day. He is definitely not a touchy-feely kind of guy, but this was bad poetry at its sentimental best. New follower. 🙂 Thanks for the chance to win! We don't do Valentine's day in our family, but I can remember when I was in school I would wish and hope that some boy would give me a valentine! Your quilt is fantastic! Love the quilting! What a cute wall hanging, love how the hearts are in a circle. Thank you for the tute, and a chance at winning. I love to shop after Valentine's day for interesting packaging, like the plastic hinged-top boxes shaped like a heart that I use for my safety pins. Of course the added bonus is that I must eat the yummy stuff inside before I can use the packaging for something useful! I'm a new follower…this is why I love blog hops…a great way to find more creative people to draw inspiration from! Your table topper is just darling! Beautiful project! I remember one Valentine's Day, my sister HAD to have this huge teddy bear with an I Love You heart. I can't even imagine her boyfriend (now husband) carrying this thing out of the mall. He is very easily embarrased. I'd love a picture of that! I'm now a blog "stalker" too! I'm already a happy follower. Wow! That is wonderful!!!! So very cute! Great tutorial, thank you! Love your mini quilt! I haven't really done much for Valentine's day in the past. I plan this year to make my kids "bouquets" of mini candy bars, I saw a few at the flower shop yesterday and they were so cute! Lovely heart quilt – I think we all have one of those templates – the plate I mean!! Best Valentines was when I found out my first grandbaby was coming – he's now 5, but still a happy memory, my special Valentines. When I was dating my husband, Curly, we went on our 3rd date the day before Valentine's Day. As we were walking around DC, a homeless man came up and asked if we would like to buy one of his hand drawn cards. It was $1. Curly paid the guy, wrote something in it, and handed it to me. It was the weirdest card I have ever gotten, but I thought it was awesome. The next day, the actual Valentine's Day, I waited all day for a phone call or email. He decided it was "too loaded" of a day to call me when we were just newly dating. A month later we were engaged. My first Valentines day with my husband he bought me beautiful roses and we went out to dinner. It was our second date and was amazing. I am already a blog stalker! 🙂 Not many Valentine's Days ago, Scott totally forgot about doing anything, and when he waltzed in the door super-late from work, having not even called or sent any email notes all day long, it took him about 3 minutes of confusedly wondering why one wife and two upper-level high school daughters were giving him the Silent Treatment and even the famous Devon Glare to realize what had happened. He silently spun around and reappeared 15 minutes later with a chocolate bar from Walgreens. Says my 16yo: "Nuh-uh!!! You gotta do better than that!!" After he left, she spins around totally huffed and says to me, "Can you *BELIEVE* how dense men can be???" I was just laughing! (Couldn't be too mad at him, as I knew how crazy work was at the time, getting ready for a big inspection.) He did a lot better with the second trip. My girls just cracked me up, though! I hid little gifts and made heart shaped notes with hints as to where the gifts were hid. fun stuff! thanks! I'm following your blog now! Thank You! I am now stalking you! We always made Valentine boxes each year when I was a kid. They were used as our own personal mailbox. I still love to get mail – nowdays, I'm happy with snail mail and email!! I love this table topper! I don't have a Valentine's Day one and I think this is the one! Thanks for the tutorial! As far a a valentine's Day story…really don't have one. We don't do much for Valentine's as our anniversary is the week before. Maybe some chocolate, please! So cute. I loved how you used the plate to center that circle of hearts. Such an easy idea, yet I had never thought of it. Thanks. My birthday is Valentine's Day, so when I was small, I used to think everyone was celebrating just for me. Thanks for the giveaway. One year DH surprised with dinner out – he was quite sneaky about it as we don't usually do much for Vday! I am a happy follower…er stalker. I don't really have any Valentine's Day stories… other than that my husband proposed the day after Valentine's Day. 🙂 Thanks for the chance to win! Great looking table topper Jane. Thank you very much for taking the time to do such a great tutorial for us. It's wonderful. Gosh, I'm not thinking of any other stories without repeating onces I've already posted during the blog hop. 🙁 If I do have any, I'm not remembering today. My brain is about a hour from our house right now because we have a new Granddaughter that's going to be making her appearance today. YAY. I am already one of your loyal stalkers. Awesome wall hanging and terrific tutorial! Thanks for participating in the blog hop and for the chance to win! I'm a follower! this is a wonderful pattern. do you have a pdf for it? I LOVE this little quilt! Thanks so much for a wonderful pattern. When my daughter was 10, we had a b-day party for her with 10 girls. I had a scavenger hunt with construction hearts all over the house. I wrote Valentine words and favorite bands and movies on them. Such fun having a Valentine baby. My mom always made my siblings and I pink, heart-shaped pancakes for breakfast. I'm planning on doing the same for my kids this year. My favorite Valentine's memory involves my high school fundraiser selling carnations. An ex-boyfriend gave me a red carnation (red = love), while my current boyfriend only gave me a pink one. I guess the pressure worked, because I have been married to the pink-carnation giver for over 25 years! I am a new blog follower – I am so glad this charm bog hop led to your site! My favorite Valentine was my first with my wife. Not because of valentines bub because of her. I have no special valentines story, but we do have a nice dinner and do the chocolates and flower for our daughters! Love the project you put together for us. Thanks!! Valentine's Day=hot tub, champagne, and strawberries! I am a happy blog stalker!! OH, I just love this project. And your tutorial is amazing–I know how difficult they can be to write but yours is clear, concise, and oh my do you make it look easy-peasy! I love this table topper! Great use of charms and excellent tutorial! I don't have a Valentines story, but my husband did once send me a love letter with the word "sweetie" misspelled throughout – he called me "sweatie" … hilarious! The only interesting thing that ever happened to me on Valentine's Day was that long, long, ago I had a boyfriend dump me! Can you believe that? All for the better in the long run. Anyhoo, thank you for the opportunity. your project is tres cute, and I love the little plate trick. I make homemade valentines day cards for my grandmothers every year. I now blog stalking you! My husband and I have a valentines journal that we write loves letters to each other in. It is fun to go back and read the years past! I don't have any special stories. Just memories of making valentine boxes in school. I am stumped for a good Valentine's Story! Now that we have 3 kids, my husband and I rarely even celebrate on the actual day. For instance, we were able to get a babysitter tonight, so tonight will be our big night out! Hey, at least we keep the romance alive, right? I'm also a devoted follower/stalker! That little quilt is darling – I've been needing a small project to try my hand at applique. This just might be it. As for a Valentine's story – my husband and I met 11 years ago today (the 11th) and he gave me one of his favorite paintings as a Valentine's gift. I use to put chocolate hearts in my husbands lunch box…which always made his work mates laugh… but to be honest when we were younger it wasn't such a big day, we just use to send cards without any names on….and get upset it we didn't get any!!!!!!!! I have just signed up to stalk you – just printed out the lollipop quilt instructions and love what you have done with your charm pack for valentines. Cute, cute, cute! I like to make a scavenger hunt for my hubby! But he's too fast at figuring it out! I remember my parents always made Valentine's a special dinner for us also – by using candles and making a "fancy" meal. Us kids always felt so special and grown up on that day! Last year we decided to involve the kids in Valentine's day more. We gave them little presents and cute Valentine's from my husband and I. It was so fun we're doing it again this year! While in College, my mom sent me a package with coffee, chocolate all stuffed in an insulated valentine's mug. I totally stalk your blog! I LOVE this project! This year I plan to cut out a bunch of little hearts and write things thy I love about my husband on each one. Then I'm gonna tape them all over the bathroom Mirror so that he has to take the time to remove them so he can get ready for work. 🙂 super cute quilt! Thanks!!! Valentine's Day is not a big day for us, but we do try to make it special in little ways like a thoughtful card or everyone's favorite for supper followed by a favorite dessert. I have never decorated for it, but I think that is going to change. This wallhanging is awesome. I really like it. Thank you for taking the time to put together this tutorial and sharing it with us. Such a beautiful wall hanging! I just love it. Thank you for sharing the tutorial. My baby brother the cowboy told us how he goes about buying presents for my SIL (he combined anniversary and Valentine's this year). A friend of his daughter's sells jewelry. Bro goes to her home (boots, spurs, hat, and work clothes), hands her cash and says, "this is how much I want to spend, no more, no less." She looks through inventory, picks something for him, and he takes it home. My SIL is amazed at his "good taste." I always make bread for my boyfriend for Valentine's Day. He's a carboholic. My husband hates that the card companies make so much money, so I have a card made from hardboard that comes out every year for valentines, wedding anniversary etc! Funny story: Last year I came home from a 2wk mission trip to Nicaragua around Valentines, and even though we grow flowers in the spring time ourselves, hubby had gone to neighbouring greenhouses, picked up fresh and potted flowers and plants, and to top it all off bought me the biggest frying pan possible. This was his story: The old one wobbled too much on the new stove, and they were on sale! Still loved it, and love using the pan! We really do not celebrate Valentine's day even though I am making something for our Grandson – a crochet Muno – oh boy what a funny looking creature that is – well anyway – I am sure I have some stories besides the stories I have told many times about our daughters bringing home their wonderful cards but I truly cannot remember them. Love your project. Love the hearts. I wrote 50 different reasons I loved my husband, each on a different small piece of paper, and hid them around the house for him to find. It took months and was great fun! I am a follower on GFC, facebook and reader. Love your blog. Pretty wall hanging/table topper and great tutorial! We do special things for each other throughout the year so it's like celebrating Valentine's Day all year long. My husband led me on a Valentine's scavenger hunt one year — best gift ever. This is a darling project. Thanks for sharing! Your gorgeous Valentine quilt just converted me to be one of your new followers to your blog. I love love love the beautiful job you did on that……even your quilting was perfect! What great use of charm squares. I would even use that border method for another quilt. You are sooooo creative! Just being with the same man (my husband) for 37 years is the best reminder every Valentine's Day. Enjoy the holiday with your loved ones and thanks for the opportunity to win such a great prize. I'm already printing directions to make this quilt! The border looked complicated until I could see the step by step – thanks for sharing this sweet tutorial. I am already a follower – yay! I really like this project. We usually go out for dinner on Valentine's Day. My best Valentine was receiving my engagement ring or so many years ago. We usually go out for dinner on Valentine's Day. The first year we were married I made a heart shaped meatloaf. It has become a tradition. This will be the 32nd heart shaped meat loaf!! I love this project! My favourite so far on this hop! No great stories except that my darling godson was born on Valentines day! I have decided I MUST be one of your stalkers! Love your blog! I get cute messages from my husband tucked in different places. One time, he dropped by at my work and as he has a key to my car, left a note for me to find on my front seat. I had no idea he had dropped by! i'm in a rut today and can't remember a valentine story 🙁 senior moments! i never thought of it as stalking … maybe wagging the tail? you're on my blog reader, i'm happy to say, and i enjoy your posts. I'm a follower by email. Thanks for the chance to win. Love the tutorial! I remember making Valentine's mail boxes out of construction paper & lots of glitter when I was a kid. After that we'd make individual valentines and "mail" them to our classmates. Thanks for the giveaway. Cute wall hanging. I am a follower. I think I am all out of stories because I can't think of any that I haven't shared. My kids have always been the one's who loved Valentine's Day. My spouse and I like to do sweet things for each other every day of the year. I liked decorating shoeboxes for our Valentine mail boxes when I was in grade school. Happy Valentine's Day! Thanks for the giveaway! That's a lovely quilt or table topper. Thanks for the idea on the border. It will come in handy on a lot of quilts! Valentine story: I was in the used bookstore and my husband had already found his books. He wandered next door to the florist and came back with the most wonderful bouquet in a beautiful vase with a big bow around it. Roses and baby's breath and greenery and carnations and daisies. LOVE the quilting on that quilt, and the fabrics! I remember making Valentine's boxes in elementary school – so fun! Last year the Mr. bought the hugest I Love You baloon. It covered almost the entire dining room table! Thanks for the great project. I follow you by email. I once sent a friend a gift card for dinner out with her nubby and arranged daycare for them so wouldn't have to pay for anything. When I was a little girl, my lovable, but clueless father used to stop off at Woolworth's on his way home from work and buy my mother a pair of nylon stockings as a Valentine's gift. He would bring me a small chocolate heart. The year I was 12, he bought me a pair of stockings. I guess I should have been excited because it was his way of recognizing I was growing up, but I really wanted the chocolate heart. HAPPILY FOLLOWING YOU VIA GFC ! THANKS TO YOU+JUDI FOR SHARING A NEAT GIVEAWAY! VALENTINES IS A SPECIAL DAY ! I USUALLY MAKE CUT-OUT COOKIES AND DECORATED THEM LAVISHLY JUST FOR THAT DAY! HAPPY VALENTINES TO YOU ! Hi! I have had the honour of being a Follower for years! I love all your designs! Thanks for the great pattern and the giveaway! Hi! I'm not sure I have a favorite memory, I remember one year our boys made Valentine's for the parents! Our stayed on our fridge for over 1 yr! This year, I'm making my own memories with some surprizes! This is the cutest little Valentine's quilt I have ever seen, always hesitated to make a Val. quilt because of the shortness of the time we can use it, but, this one you have designed is perfect. Can't wait to make it. That in itself will make this a special Valentine's Day for my loved ones. I am now a follower of your blog. My niece was born on Valentine's day and it's always fun finding Happy Birthday and Happy Valentine's Day cards combined. I am now a follower of your site, love it. One year I pretended I didn't have anything for my husband and just when he thought I didn't, I gave him just what he wanted! I'm stalking you via email! What a great tutorial. Love the the color diagrams. You really do beautiful work. Thanks for sharing. I don't have any special valentine stories. I am now a follower of your blog through email. I like getting the news straight to my email. I love valentine's day. I love making cookies or cupcakes for my children's class with them. It is great having fun and making a mess together in the kitchen. I follow you via e-mail, you are so talented. What a fun project, and a great tutorial — very clear instructions! I've decided to follow you around and see what you do next! Hubby and I toast one another on Valentine's Day with the toasting goblets from our wedding. Other than that, we just have a nice dinner at home, so nothing really stands out as a "favorite" story. My memory is finding little chocolate hearts hidden all over the house in strange places, so as I would go about my weekly clean I would find one here and there, and it would always make me smile and make me think of my husband. It's the little things that are always the sweetest. We like to keep our Valentine's day simple and sweet! No expensive gifts! I like to make little handmade things for my husband and he usually gets me little treats! It keeps it a sweet, non-commercialized holiday for us! I just LOVE that quilt!! I wish I were that talented!!! Yes, I am "blog stalking" you! I had a boyfriend who gave me a diamond ring once for Valentine's Day. He hid it in some ice cream. But he was so fastidious that he put it in a plastic bag first so it wouldn't get dirty. I didn't marry him. The end. We don't do Valentine's Day at our house but I do have a Valentine that my FIL sent to his future wife (my MIL) by mail back in 1929 when she was 21 years old. It was addressed and signed in pencil and it is very precious to me! I'm racking my brains to come up with a story, but Valentines Day is just another day in the year. The sweetest things are the little cards that the kids bring home from school! I love your quilt: I have it bookmarked so I can make it later. It's a great design! I can see it with flowers in place of the hearts. And it was good to see that you quilted it before appliqueing the hearts on. I've never seen that done before, but I can see that it would make the quilting much easier. Thanks for the great idea!! I'm now blog stalking you! A great quilt, and your quilting on it is beautiful – I love how you used the pink thread. I received a flowering shrub one year from a guy for Valentine's Day. At the time, I was in college, living in a dorm. I know what roses mean, but a shrub?!? V Day story? Well, this hasn't happened yet, so let's just pretend…My sister is due on Valentine's Day so if my niece makes an appearance this Tuesday it will become my new fav V Day story 🙂 Beautiful tutorial btw! My husband and I celebrated Valentine's by going to Olive Garden for lunch today. It's a 1 hr, 45 min trip to our closest location, but it sure was worth the trip! That is such a sweet quilt! I'm now going to blog stalk you! My least favourite thing about Valentine's Day is that everything is so expensive that day. I've forbade hubby from buying me anything for the day! But he's most welcome to spoil me any other day of the year! One of my former jobs was delivering balloons. It was alway great fun to deliver a bouquet to a guy at work. Seemed to really embaress them. I am now a follower. I loved your instructions of using the plate to place the hearts. Good idea. Not a lot of Valentine's stories for me, but I do remember the year I had to be out of town for work on V-day and my husband drove 3 hours to come and visit me and take me out to dinner. I thought that was sweet. Love your tutorial. Thanks for the great giveaway. Money was tight and my idea for Valentine's Day was to make a "heart shaped" meal. Meatloaf, mashed potatoes, muffins, chocolates…everything was hear shaped and made with love. Thanks for the chance at your giveaway. My oldest daughter got married today. I think that is our Valentine celebration for this year. On Valentine's Day when my children were little I used to pack their lunches with heart shaped sandwiches. They always looked forward to that little treat! I have been following your blog and shared your Desperate Housewife's Quilt blocks with friends recently. I am anxious to try the recent paper pieced block. Valentine's Day story: Well, today I remembered something sweet about my dad. He was a very romantic guy, and as a senior citizen always gave my mom a big bouquet of red roses for Valentine's Day. But he was very picky–he wouldn't buy them at the grocery store or Conroy's, where the roses were kind of cheap and of poor quality. He found a nursery where they brought in gorgeous roses and sold them in lovely arrangements. One year, he wasn't feeling well and asked me to run to that nursery–about an hour from my house–to pick them up, and then bring them on over to their home. I am so glad I did, because it turned out to be his last Valentine's Day, and his last romantic gift to my mom in 39 years of marriage. It's a good lesson to me, to remember to make the effort, to perform the seemingly small acts of service that may turn out to be bigger than I realize at the time. Valentines is always an exciting day in the kindergarten – they love making valentines and a pair of Rose colored glasses. I was proposed to on V-day. That's exciting, right? Loved your tutorial. It was extremely well written and the diagrams for the piecing were fabulous. And it's really really cute to boot!! Every year I make sure everyone at work (about 60 people) get something for Valentine's, usually candy and a cute "kiddy" valentine. It makes people smile so I love it. This year I scheduled the work birthday potluck on Valentine's so I am going to raffle off a giant bar of chocolate, as well as give my regular treats. I am a new follower! Thank you for the wonderful tutorial on such an adorable topper! I am truly inspired to attempt applique! A favorite Valentine moment for me was watching my first class pass out their Valentine's with much excitement! I suppose you want good stories but when you live in Chicago Febuary can be a scary weather month for driving. I used to go to work at 3:30 AM and one year a snowstorm hit with lots of ice under of course I slid on the ice and managed to hit the only other car on the road. A very expensive Valentines Day indeed. No one was hurt though so all was well except the totalled car. Valentines in not big in this house, I have a wonderful husband of 33years and everyday is Valentines when you are married to your best friend. However this week we are going to see Love Never Dies at the Capitol Theatre in Sydney, not Tuesday but Thursday. This is so cute. I absolutely love it! What a great tutorial. I don't have any valentines stories but I would have loved to be one of your friends. That is a great idea. I love it!!! The quilt is lovely too, thanks for sharing your wonderful tutorial. I always loved making the valentine shoe boxes in elementary school and deliberating over what valentine to give to classmates. I do follow your blog, don't often comment, but enjoy it immensely. I was in my granddaughter's 1st grade class last week and saw several boxes of can with handles wired on. I think the kids will get to decorate them for their Valentine boxes. Can't wait to see hers when she brings it home. I remember making the large envelopes or bringing shoe boxes from home, and decorating them in class for Valentines. Great memories of a long ago time. Back in high school, I didn't have a boyfriend and was feeling rather left out on Valentine's Day. My dad had a flower sent to the school for me! He wrote that it was from a secret admirer so that I could make all the other kids jealous. 😉 It totally made my day. New follower here, no great stories to tell – hopefully this year will be the one! This quilt is beautiful, love the hearts in a circle, and your addition of the grey fabric. Very pretty. Don't have a Valeninte, so it's not a special day for me. I like the colors you selected for your project. The directions are very clear too. Please put my name in the mix for the drawing. Unfortunately no valentine stories are coming to mind – get so busy with things that it's just not something we do now. I still have the hearts my son and I painted when he was little – we used to make them for my parents…. I don't have any Valentine stories that stick – no significant other makes that difficult! 🙂 I love getting flowers though. Love! the tutorial & the finished quilt – especially the grey background. Thank you for the tutorial to your sweet little quilt. I love it. My best valentines memories are the silly heart people my kids made for me at school. Still have many of them. What a wonderful quilt! Valentine's Day is never exciting for us – but thats fine by me. I am perfectly content snuggled up on the couch with my husband and the puppy watching movies. That is how we plan to spend this year to! One year for Valentine's Day (oh, probably about 10 years ago) I decided to cook my boyfriend (now husband) a romantic dinner. I planned this weeks in advance, including making some spiced/mulled wine that had to infuse for about 3 weeks. The dinner was lovely… the wine, not so much! Considering how much effort I'd put in to making it, my disappointment factor was very high! I have never put that much effort into another Valentine's meal. Love the pink and gray heart quilt. Nice tut. Any Valentine story involves chocolate and roses. My favorite Valentine's Day story is that our daughter was due on that day but waited until March 2nd to make her appearance – 16 days later! One year I received 2 bunches of flowers at work on Valentine's Day from anonymous senders. It's 5 years later and I still have no idea who sent them! All I do know is that I was cheesin' like a Cheshire cat that day 🙂 thanks! Thanks Sha for a great tutorial. Loving your table topper! Your boarders are neat, simple but alot of color all the way around. Like that you used gray for the background as well. What a neat way to "line" up the hearts you put in the middle. I'll have to remember that so I can use it in the future. Thanks again! We are not big Valentines Day folks so I don't have any stories. I did love getting cards that the kids made in school when they were young. I have held on to them and love going back through and reading them from time to time. Thank you and Green Fairy Quilts for the awesome giveaway and a chance to win. Yes, I am happily following you. Thanks again for the super duper giveaway and a chance to win. We don;t usually do Valentine's Day this year we did. Last Thursday, the hubby and I went out and just shopped around at goodwill's and Salvation Army. My hubby has never complained after all the fabric stores, antique malls and goodwills. Well this time, we bought each other gifts and he out did himself. I bought him a very limited Warcraft II collector's edition game with the unwrapped signed poster in it for $8. He bought me a 35 peice Set of Platinum China. I have always wanted china and he really knew my style. Colors and design was spot on. He paid $30 for the set. We got home and we were curious of what the actual value of our purchases were… not that we were wanting to resale.. but just curious. Well… I thought I had done well.. Spent $8 and found the exact same game only without the signed poster we got was selling for $400! Plus we had the unwrapped signed poster! Well, he outdid me. Even just one of the 14inch platters sold from the main site for $140 each and on amazon $98 each. He spent $30… and the set just based on Amazon prices is worth $705! I am not a rich person which is why I buy clothes and everything at goodwill, but this Valentines day, we managed to surprise ourselves by getting things for each other we both not only loved but were surprisingly valued! My DH & I were married on Valentine's Day – 24 years ago tomorrow, and he picked the date. 🙂 Thank you for the tutorial, very cute and very easy to follow!! Thanks for the chance to win! I love your project, especially the borders. Our Valentine celebration usually consist of a special homemade meal, usally steaks, with cherry cheesecake for dessert. This is so adorable! It is on my to do list. I pushed the folower button. Thanks so much! This is just so pretty and striking with the gray background ! and your tute is so so easy to follow — THANKS !!!! We don't really celebrate Valentines day with much more than cards . One year , my husband and I went shopping at Walmart ( real romantic ,huh ???? yikes !! ) and the had red tea rose plants marked down to $2 . I told him to get me one and I'd plant it and see if it survives . It did ! It thrived for about 3 years . I am anxious to see if it comes back , because bunnies and other critters have destroyed my flower garden . Something has eaten up most of my lilly bulbs too ! I am now following your blog !!!!!!!!!!!! Favorite Valentine's Day memory is when my hubby took me to a Sweetheart banquet sponsored by the church we were attending. We were young teenagers then and now we have been married 42 years this year! Thanks for the giveaway chance. I am a new follower here. Thanks again for the giveaway chance! When my kids were little I always prepared a red and white dinner on Valentines day. Some sort of pasta with red sauce, maybe some cauliflower and a white cake with strawberries and pink frosting. Seeing them do the same as adults reminds me that it is the simple traditions that really stick with them! I'm a stalker…. I mean follower! Love your blog! Every year for Valentines day we hang out with a bunch of friends and get heart-shaped pizzas from Papa Murphy's. Really low key and fun. I am blog stalking you! I LOVE this!!!!! The grey fabric is so wonderful with it. Thanks for the tutorial. Growing up my dad would always give us small gifts on Valentine's day and my mom would give my brother one. Oh boy, when I saw your Tutorial detail I followed you right away! Your style works for me and I am happy to have found you! Valentines Memory ~ hummm ~ after our 1st daughter was born, she was 6 months old, my hubby arranged for my friend to do my hair and his sister to babysit and we went out for Desert! I had to let the seams out of my fancy dress, we had desert in a fancy restaurant and weren't allowed to talk about the baby! It was nice to feel like a woman again! My favorite remberance from Valentines day is making cut out sugar cookies with my now grown children. We would all work together and frost and decorate them. Your design and tutorial are fantastic, thanks for sharing. I am a new follower/stalker of your blog. My husband and I don't do anything for valentine's day. But every year we get our boys a little box of their favorite candy and celebrate with family time. I am now a happy blog stalker! I have to tell you how very much I love this little quilt. It may be just the thing to get me to face my fear of applique! Thank you! I can't believe you call that a simple project — it looks amazing! My husband and I are not big fans of Valentine's Day, so we usually spend the day trying to pretend that it's not happenening. It just feels forced to me! We are very sweet year round, so I'm always more content with our usual day to day affection. I luv your table topper tutorial….thanks for sharing your time and talent by participating in the Valentine blog hop. Also, a big thank you to Kimberly, Judi, Leah and Julie for the generous giveaway prizes. I am a follower. I really don't have a valentine's story but I just love your quilt. Thanks for the tutorial. This is going on my to do list! My valentines story isn`t much but here goes: I work in an NICU and it is so neat to me to see babes born on Valentines, just watching the joy in parents faces when they get to really see their baby for the first time and we wish them a happy birthday and valentines day at the same time. It just seems to be a very special moment to watch/be apart of. Thanks for hosting the give away!! Also a follower of your blog! This is the cutest mini quilt I've seen in a long time. I LOVE it! I don't have too many memories, it's not that big of a deal at our house. I loved it when my daughter was really little and my husband took her shopping for our first Valentine's Day as a family. "They" got me a card and some candy roses. Precious! Love the wall hanging. No story for me because I'm not really into Valentines day. Thanks for the giveaway. Some years ago–maybe 5 or 6–I made up the "Valentine's Fairy," and even though my daughter is now 8-1/2, she still believes, or maybe just wants to so she'll get a present. Beautiful. I am now a follower. Favorite memory is when my hubby (then boyfriend) bribed his roomates to leave for the night and cleaned the bach pad so we could have a lovely romantic night at his place. One year the hubs had my dog groomed for me and it was the best goft ever! Done stalking, now an official follower! Thank you for a clear-written & organized tutorial. I will follow your blog! My sister's birthday is Valentine's Day so we have Birthday/Valentine parties. Love them. Valentine's day- Since I'm a grandmother (GG is my grandmother name! )I send my 2 grandkids a valentine of their own. I always put this sticker on the back of the envelope. 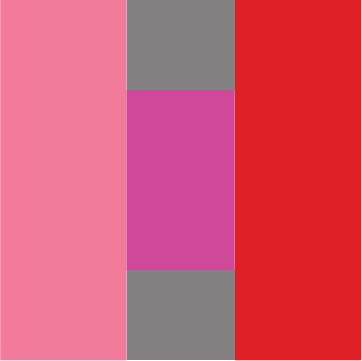 It looks just like I kissed the envelope- the sticker comes in many fabulous shades of red, pink, purple (lip size). Thinking, after the fact, that perhaps they're getting too old for me to send them Valentines, I checked in with my daughter to ask if they got them yet. 'Yes,when they flipped the envelope over & saw the Kiss, they said, Yea! This is from GG!' Are they too old? 'No, are you kidding?" my husband and i got engaged on a beach in playa ten years ago! where does the time go?! I love this little quilt! And I too, am a huge fan of needle turn appliqué. Thanks for an awesome giveaway. As for Valentines, it is my husband's daughter's birthday so that is what we celebrate on this day! My husband is so amazing that he makes every day like Valentine's day. A lovely, sweet Valentine for a special someone! My husband and I have shared 49 Valentine Days, he has never forgotten one – I am a lucky girl. Our first V-Day together, my husband gave me a stuffed velvet frog, which we named Tobias Winston McPhibbian III, AKA Toby. He sleeps with us every night and goes everywhere we go. He's been to California, Nevada, Montana, Oregon, Washington, and Mexico. He's been on road trips and on airplanes. He's stayed in luxury suites and in tents. He was even sitting at the table on Valentine's Day when my husband proposed; after all…it was his first birthday! Now after 12 years, he's older and much more squished but he is part of our family. When my 7 year old is sick, she asks for Toby…just like I do. My favorite thing about Toby? That my husband knew me so well that he picked the PERFECT gift for our first V-Day together. Very lovely project. It's going on my to do list! One year we has about 5 couples over and I made and decorated double heart cakes for every couple. Very fun! thanks for the wonderful circle of love quilt! It is great and has been added to me list of quilts to make….got three in line to finish at the moment. thanks for the wonderful and charming "Circle of Love." I have added it to my "to do" list. I have three quilts in process, I am completing then can start this great little quilt! have some nice red fabric with hearts in my stash.